I understand and respect your privacy. If you ever wish to share a photo in private or for the site just let me know. Good luck with the restoration, hope to see it on the road one day. Had a chance to see Paul's car at Sandown Historics recently and had a good look over it. Found it interesting the chassis was very similar to that on my Buchanan Holden. I think Pressed Metal Corp modified the original Buchanan design for the Cobra. I have heard of one other Cobra that is about, hopefully I will have more details soon. Update for Buchanan Cobra Number 3. Photograph taken at The Phillip Island Classic March 2013 of Paul Schilling in the restored Buchanan Cobra. Researched and written by Paul SCHILLING. This is the history of a Buchanan Cobra, which came into my possession in July of 2004; it is body number 3, with a serial number of 12161. This car is one of an apparent seven cars produced between 1958 and 1961 initially by Nat Buchanan in conjunction with Pressed Metal Corp Ltd who built the box section chassis and later by J&S Fiberglass Sales. They were all built in New South Wales. The business went belly up probably early 1960 with the introduction of the Bug Eye Austin Healy Sprite, which was marginally cheaper and faster. The business was taken over by J&S Fiberglass sales probably in 1960 or 61 and they completed the remaining bodies already commenced by Nat Buchanan. The vehicle had been owned and stored by an associate of mine one John Bradbury of Templestowe since he acquired it from Duttons Car sales early in 1995. The engine had been stripped down after a camshaft failure shortly after John acquired the car and John was intent on getting the rebuild done at the expense of the original engine builder. The block, head and parts sat under the Bench(es) at Tate Engines in Queen Street Hawthorn and later at Metropolitan Avenue at Blackburn for about 8 years as a civil action against the engine builder finally lapsed. The Cobra and another vehicle acquired by John at the same time as the Cobra sat in his garages through three house moves until both cars were purchased by myself in July of 2004. The first record that I could find of this car since it completion sometime between 1959 to 1961 was that it had found its way into the hands of a person named Wayne Fletcher of Queenbean A.C.T. some time in 1983. The car had the build number of 003 on an identification plate attached to the fiberglass firewall. At the time the vehicle was discovered by Fletcher sometime in 1983, this Buchanan Cobra had acquired a Datsun 1500cc motor and 4 speed gear box and had a radiator sticking up through large hole in the front panel and was being used by a couple of boys somewhere in Queenbean as a paddock bomb. Enter one Richard. G. ROSE sometime in 1985/86 who resided in Maroubra in New South Wales who had heard about this Buchanan Cobra through an unidentified source and decided to purchase it for the purpose of developing it into a racing car to race in Historic classes in N.S.W. He purchased the vehicle sometime in 1985/6. I have spoken to Richard Rose on a number of occasions since obtaining possession of the Cobra and he has provided the early history of the car. The Buchanan Cobra was duly restored by Richard and acquired a Historic Log book number V6867 from C.A.M.S. on the 7.8.1987 as a Category 5 Group LA vehicle. Richard ran the Buchanan with the 994 cc Standard ten motors until 1991 when he fitted the 1147cc motor. The history is a little vague at this stage as the N.H Buchanan Motor Co Pty. Ltd. closed down in about 1960/61 and was bought out by J&S Fiberglass of 287 Ramsay Road Haberfield in NSW. Nat Buchanan had finished at least 2 cobras and J&S continued to complete the remaining cobras to make 7 in all completed. J&S also completed the other Buchanan bodies for the Buchanan Holdens and the M.G. chassis cars of which about 135 bodies were completed by Nat Buchanan and later J&S Fibreglass. Three of the seven Cobras have also been identified as remaining, one is in New Zealand and was recently sold on E-Bay for $3000.00 NZ in bits and having been converted at some time to Jaguar XJ6 mechanicals, at the time of writing this car is still in bits and very unlikely to proceed much further. The other Cobra is in NSW in the hands of a “collector” who also collects Lloyd Alexanders and other exotic collections of cars, bits and pieces and this car is probably destined to remain as an ongoing project much like the Cobra in N.Z. Richard Rose raced the Cobra in 994cc capacity until 1991 when his research disclosed the J&S Fibreglass completed the remainder of Cobras with the 1147 Triumph Herald motors and twin S.U carburetors. A letter from the Factory Manager Richard Maryland indicated the later fitment of the 1147cc Triumph Herald motors and twin S.U. carburetors. I have not been able to ascertain just when J&S Fibreglass acquired the remaining Buchanan bodies and the uncompleted Cobras. J & S Fibreglass when into liquidation in 1980 and I am unable to locate another company of the same name to this day. I am not able to say with any accuracy, which Buchanan Cobras, how many or them or the body numbers of them, were built by J&S Fiberglass, or at what year this endeavor began and was completed. I am however able to say that the Buchanan Cobra model which apparently consisted of seven vehicles being build, over a period from 1959 to 1961 and at some stage the model acquired the 1147cc Triumph Herald motors with twin S.U carburetors. Nat Buchanan provided one completed Cobra registration number NSW BMG-000 for road testing in September of 1958 by Modern Motor magazine He later went on to provide another car, registered number BMG111 for road test by Sports Car World in May of 1959. Another road test was conducted by the Great Australian Sports Cars and Specials, magazine on the same car registered number BMG111 and this article makes mention of the fitting of the larger Triumph Herald engine to the Buchanan Cobra. It is not clear when this article was written but it is clear that it was written after the fitment of the larger 1147 motors. 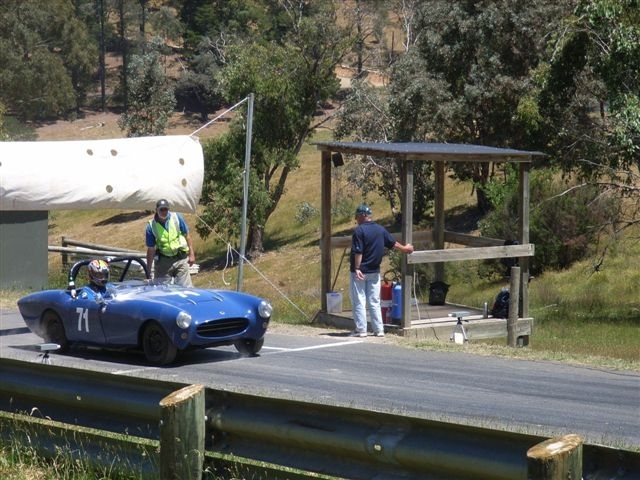 I am a member of the Victorian Racing Register and as such have been campaigning the Cobra in historic events in Victoria since early 2005 and enjoying some success with it in Regularity, Hill Climbs, and Sprints etc. It is a great little car and with the 1147 cc motor it is quite rapid and regularly give M.G.s TCs As and Bs and Austin Healy Sprites a run for their money. The car has a current CAMS historic log book in Group SA. Production Sports Cars. Are there any other Buchanan enthusiasts out there?? Things have been dormant for a while on the Boring Old Farts Racing Team and the Buchanan scene due to a motor moment on my Cobra at the Phillip Island Classic event this year. However work has progressed 'steadily' on the NEW motor with everything that can be done the an 1147 Spitfire, (with the exception of an 8 port head) has been done and it is now awaiting assembly in Nunawading. I will not be entering the incompletre Cobra in the Sandown Meeting this November but I am hoping to run one of my Ford Capris (SA) in Regularity with the permission of the Sandown Race Committee. Numbers for Sandown are a little languid at this point so it is fair to say that it is about time to get off your dearie aire and put in an entry. Sandown is one of the three annual VHRR events and is not to be missed..
All times are GMT +11. The time now is 03:52 AM.